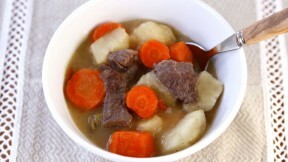 Enjoy a hearty slow-cooked meal with this adaptation of an original beef stew fed to the Union army. Tori Avey explores the full story of the challenges of feeding soldiers during the Civil War in The History Kitchen. In a small bowl, whisk together the flour with 1/2 cup cold water till a thick, smooth liquid forms. Slowly stir the flour water into the stew pot. Season the pot with salt and pepper (I used 1 1/4 tsp of salt and 1/2 tsp black pepper; use more or less to taste if you prefer). Bring to a boil.